I was introduced to this saucy recipe by Tobias, a very able field instructor I have worked with for many years. It instantly became a favorite for my Animal Processing Workshops. It is simple to prepare, utilizes sinewy portions of meat and it is scrumptiously delicious. Give yourself plenty of time to let it simmer, since it becomes more yummy the thicker the sauce becomes. Serve with rice or boiled potatoes and salad. Enjoy. This saucy dish is a great way to use the sinewy meat of an animal. Photo courtesy of Brian Harris. Roast the Anaheim peppers on the coals until the skin is slightly brown. Place in a plastic bag to “sweat” the peppers for about five minutes. Peal the skin from the peppers, open and de-seed the peppers and dice. Sauté the onions in the fat, when the onions are tender, add the garlic, bell peppers and Anaheim peppers and sauté for a few more minutes. Add the spice mix and stir in well. Add the cubed meat. 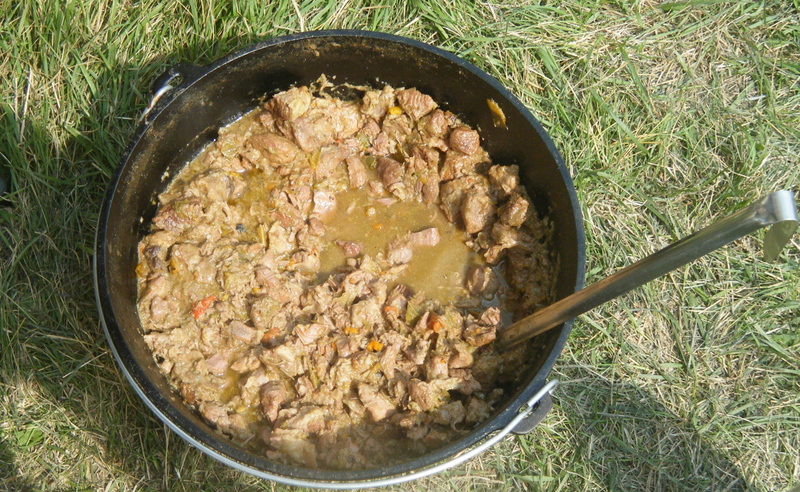 Cook over medium heat and stir regularly until the meat browns and a broth forms. Reduce the heat and simmer for 2 to 4 hours, stirring ocasionally. Simmer until the meat is tender, however, a longer simmer allows for a thicker and richer stew. Enjoy with corn tortillas and a salad!